On the line with me is Andrew Rissik, who is the MD of Forex and International Projects at Sable International. Andrew, it’s good to have you on the podcast again. We’re going to talk about how one can diversify their investments to hedge against the volatile rand. But before we get into this topic, let’s talk about the SA economy of late. We’re in a recession. The rand weakened substantially last week. What are your thoughts on the state of the SA economy right now? Gareth, firstly thanks very much for having me and chatting to me again: it’s always good to speak to BizNews. With regard to the current situation that we’re in, it’s a technical recession and you’re hearing a lot of people saying, it’s not really a recession. But the fact of the matter is that our economy is in trouble and I think if you put aside politics and, more particularly, identity politics and all the stuff that we’re reading in the mainstream media – the reality of the situation is that we have a government at the moment that is not really in a position to do anything to stimulate the economy and to try to actually fix the problems that we have. This is because we’re sitting in a limbo position between now and the election in 2019, where Cyril Ramaphosa, I think, is in a fairly weak position because he relies on a lot of people to help him win next year’s election – he’s got to try and get a majority. That’s going to make it really tricky and I think a lot of the stuff that’s happening now, that’s put us into a recession, is also a result both internal and external factors. So, it’s not really all South Africa. For example, the internal issues are things like the Mining Charter. We’re really not making anybody feel comfortable about investing into the mining sector. Then we’ve got an ongoing financial drain going on at the SOEs (State Owned Enterprises) plus, obviously, the big elephant in the room is expropriation, which I think is being blown out of proportion, but understandably so. People are holding back on investment and all of this contributes towards slowing the economy down. Then we have the external factors, where we saw a big crash in the rand last week but that was really an emerging market play and SA got caught in the cross-fire. Donald Trump and the Chinese talking about a ‘trade war’ is rand-negative and, I think, certainly contributing to SA’s economic woes. Looking forward, where do you see the economy going? Obviously, as you’ve mentioned, we’re in a technical recession and that’s coming off the back of a very bad second-quarter. We’re in the third-quarter, which looks like it’s going to be even worse. The rand has weakened already so, do you think that we’re in a prolonged, bad situation here? Yes, I do. I try and remain positive and I don’t really want to be one of these doomsday kind of people. But if you understand economics, you’ve got to have a look at the numbers and you’ve got to say: “Where are we going? How are we going to get out of this mess?”. The only thing that we can do is we either tax and spend our way out. But the government can’t really tax the taxpayers much more because we all know what happened in the last budget just after Cyril Ramaphosa came in. We’ve seen some pretty harsh tax increases, the fuel levy, and VAT – these are all things that are hampering growth because people aren’t spending. People simply just don’t have disposable income and, also, with the rand having been really wiped out — it’s lost 19% against the USD this year so far — that just means that all our imported goods are more expensive. Plus, we’ve also got the oil prices going up and that’s a dollar-based commodity. So, again, it just puts a very high inflationary effect into our economy and when you stir in a little bit of political noise and uncertainty – I think people just stop spending. I think we’re going to see long-term stress in our economy. Amid this backdrop, what can one do to protect their wealth in an economy as unstable as ours? I think that you’ve got to look at SA in more than one way. I think the global economy and the world is changing fast. If you look at SA’s alliances: there are a lot of visits to China at the moment. We’re walking over to the UAE about loans – these are all loans where we don’t really understand the full extent of the terms. We don’t know what they look like. I think it’s quite sinister because we have had a big move towards a more communist-leaning approach to the economy. But the reality of the situation is that we’re a commodity-based economy. Even though our mining sector has been hard hit in the last 5 years, we’re still a primary exporter of agricultural products and of mining our minerals, and we’re an emerging market. So, I think in this modern world, one needs to take a balanced view, and if you want to hedge your investments then you should look into investing in economies that offer something different. So, look at economies that are not necessarily very dependent on commodities, certainly not an emerging market economy, and diversify from everything that you have here. You should really be looking into the first world economies where, things like the Rule of Law, Property Rights, etc. offer a good balance to what we are starting to feel in this country. Having said all of this then, why is Portugal – which is a first world country – such an attractive investment destination? Well, ironically, I think South Africans have a strong tendency towards investing in real estate. It’s been very much a part of our DNA. We are quite like the Brits in that way – everybody wants to own real estate. What you have to do is turn around and say, “Well, you own bricks and mortar. It’s quite a nice investment.” If you qualify you can get offshore mortgages. Real estate then is something that South Africans are familiar with and what you need to understand is what’s actually going on in those markets. Portugal has been a particularly interesting one, in that in 2012 they were bailed out as part of a wider bailout in Europe where five countries got bailed-out by the IMF and the World Bank. Portugal then made a whole lot of changes to attract investment. What’s interesting about Portugal and why we like it is that it’s a first world country, and it’s part of the EU. But it doesn’t have a lot of the political stresses and the worries about the migrants that some of the other parts of Europe have. It’s a relatively poor country, but it’s very integral in Western Europe. There’ve been really solid capital gains in the last 3-4 years, and good rental yields. We see it as a very stable economy, albeit it’s not 100% out of the woodworks yet, but they’ve been upgraded recently by all the credit agencies, which is the opposite trend to what’s happening in SA. Also, what’s quite important to understand is that it’s actually a very tax-friendly jurisdiction. So, one needs to take into account, when investing offshore, what the tax implications are, and Portugal is really attractive. When talking about Portugal, the topic of the Golden Visa programme naturally comes up as well. Can you tell us more about this and the incentives around it? Yes, in 2012, as I mentioned earlier, the Portuguese Government was putting their heads together to try and move out of a real economic mess that they had got themselves into. And part of the modernisation of the economy was to start looking at attracting capital and they, obviously, had put in some really interesting, long-term tax incentives, to attract European residents from other high rate jurisdictions – like Sweden, France etc – to actually move to Portugal and become a tax resident in Portugal. What they did is they created this thing called the Golden Visa, which was specifically targeting non-European investors. 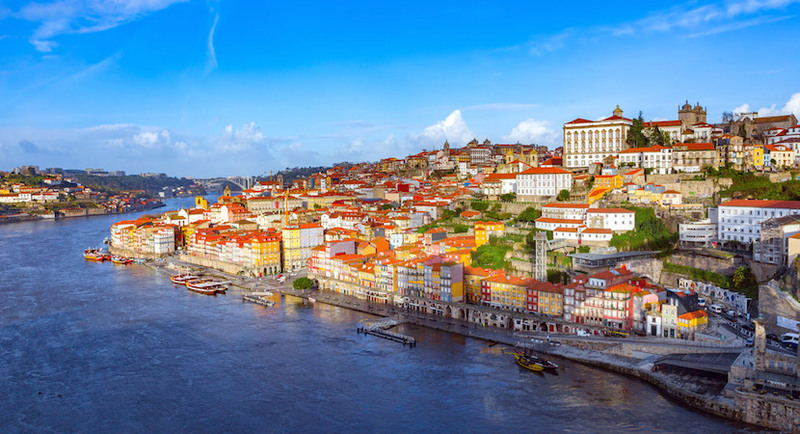 For a minimum investment of €500 000 into real estate, a non-European could qualify for Portuguese residency on fairly easy terms, provided certain conditions were met. This then can lead to Portuguese citizenship, which is obviously very attractive – especially when you look at the situation that South Africans are sitting in. It’s quite a nice added bonus on the back of a really interesting property investment. Andrew, what has the interest been like from South Africans themselves? Have you seen interest picking up in recent weeks and months, amid the economic bloodbath down here? Yes, I think we’ve been exposed through both our currency business and immigration business to the mood of South Africans and what they’re doing for themselves, and their money, in terms of an offshore plan. We’ve certainly seen, in the last 4-5 months, a really big increase in enquiries. People are just looking for that plan B. We’ve been talking about plan B’s in SA for a long time, but there’s been a real mood change, and I think one of the big drivers has been the discussion about land expropriation. It’s something that is a real fear for South Africans because I think most people, or a lot of people, create their wealth and longer-term wealth planning through real estate. So, I think that’s been a big driver and just to give you an idea: we’ve seen a 300% increase in enquiries in August this year compared to what we had at the same time last year, running up to the ANC elective conference. I think that says it all. So Ramaphoria is truly dead? I think, sadly, it is. If you had listened to Ramaphosa when he first got into power, what he said – he is still sticking to. The view is that, “This is an interim arrangement to get me to the next election, after which we’ll really start making the changes.” But people are impatient. We live in a world where people want action immediately. We all know state capture happened. We know who the perpetrators were, but nobody has gone to jail yet, and I think people are wanting to see some real action and some real consequences. I think if that happens, the mood might change but at the moment people are starting to lose hope and I think that’s kicked up a gear now that we’ve gone into recession for the second time in nine years. For anybody who is listening to this podcast, if they’re interested in finding out more about investing in a country like Portugal through the Golden Visa programme, what’s the best way that they can get in touch with you guys? The best way would be to get hold of us either by email. They can email [email protected] or they can just Google “Sable International” and get hold of us and we’ll be more than happy to have a chat with them. We are also running an investor roadshow at the end of September. We’ll be in Johannesburg on the 25th and 26th September, and we’ll be in Durban on the 27th and Cape Town on the 28th, where we’ll be showcasing some really nice investment opportunities, specifically to Portugal. Andrew Rissik, it’s been a pleasure chatting to you again. Thanks so much for giving us the latest at Sable International.